28th October: Paul Holt reported the wind as "even wilder than yesterday, but lessened slightly in the afternoon". 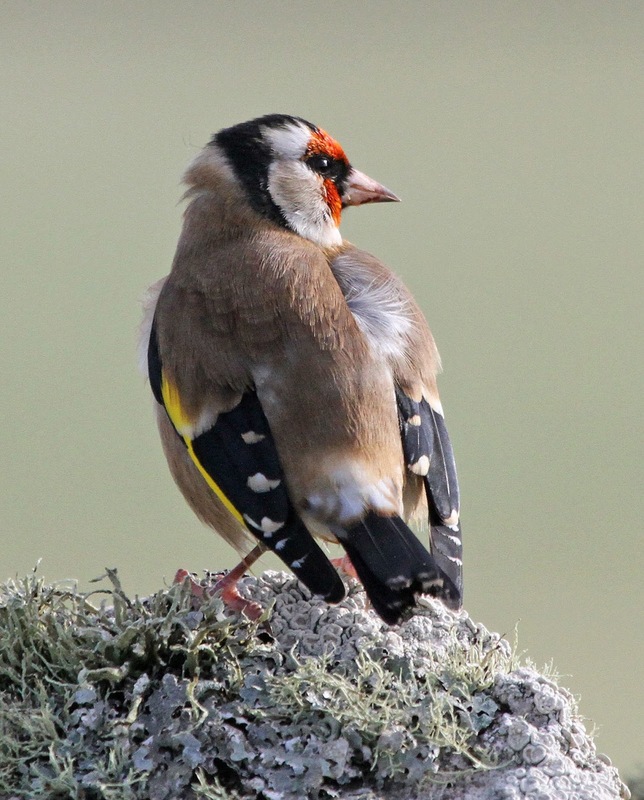 His round-up of birds reads: Great Spotted Woodpecker still present, four Goldcrests, one Chiffchaff, two Blackcaps, one Mistle Thrush, 40 Blackbirds, 52 Redwings, eight Song Thrushes, seven Fieldfares, one Black Redstart, two Bramblings, 140 Chaffinches, two Siskins, two Redpolls and one Snow Bunting. A selection of Paul's photos from his week on Lundy (including four record shots of the American Robin) appear below. 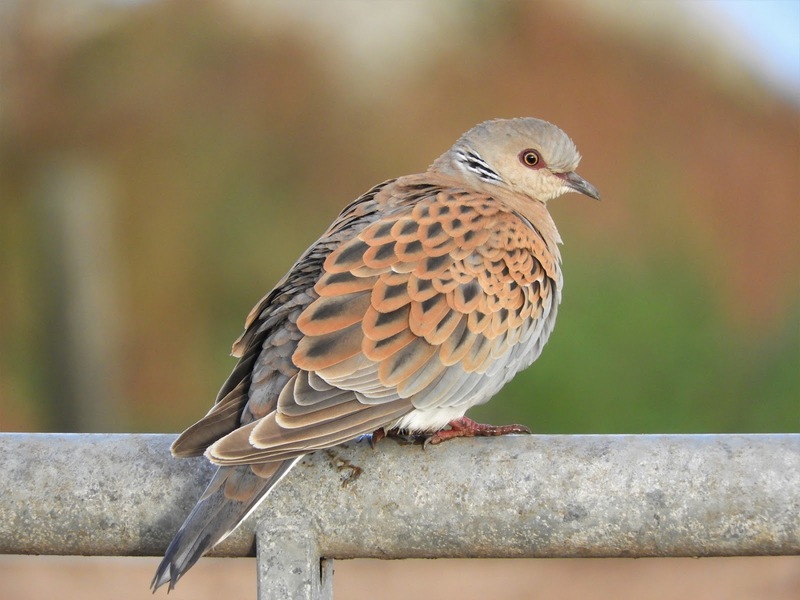 Thanks to everyone who has texted or emailed their sightings for the blog this autumn. With Warden Dean Jones now off the island on a well-deserved holiday, and seemingly no birdwatchers currently 'in residence', that's probably it from Lundy until Martin Thorne goes over for a week from 12th November. 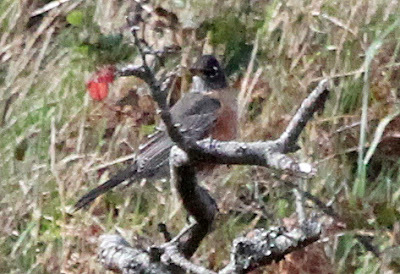 The following update arrived from Paul Holt late in the evening : "Despite searching until dusk could not re-find the American Robin – seen for 15 minutes around 13.50 in Millcombe and then in St John's Valley." 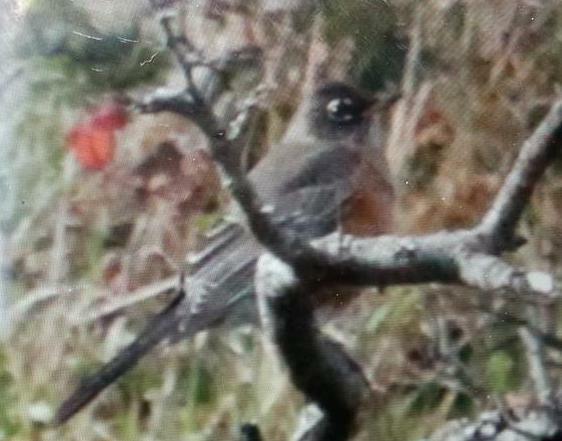 Here's one of the photos Paul took of the bird, a mobile phone shot of the back of his camera. 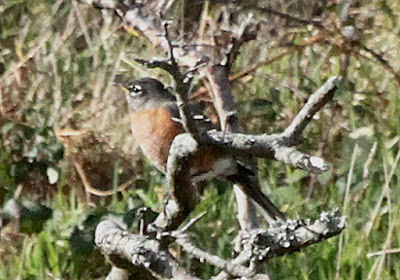 Other birds seen by Paul, some of which were reported earlier by Trevor and Karen Dobie (see below) were one Yellow-browed Warbler, a Garden Warbler, a Ring Ouzel, one Jackdaw, the Great Spotted Woodpecker, six Blackcaps, two Chiffchaffs, two Merlins, one Kestrel, eight Goldcrests, four Redpolls, two Siskins, 18 Fieldfares, 40 Redwings and five Stonechats. Andy Jayne, whilst on his way back from his week on Lundy on the Oldenburg, received a text from Paul Holt to say that he had found an American Robin. The latest news from Paul, at 16.35 hrs, is that the bird was seen briefly in Millcombe, and that he has taken photos of the bird. This will be Lundy's fourth following occurrences in 1952 (also a first for Britain), 1962 and 1982. Before boarding the boat Andy did a seawatch which produced five Bonxies and one Manx Shearwater. In something of a frustrating week for him, Andy saw six grey geese flying up the East Side at 11.05 this morning, but he was unable to identify them to species, but most likely Pinkfeet. Postscript: Intriguingly, Tony Taylor reported six White-fronted Geese arriving in West Pembrokeshire from the south later the same day! Trevor and Karen Dobie arrived today on a "rough ride over on a splash and dash Oldie trip". They haven't seen the American Robin but during "a quick wander through Millcombe at sunset" they saw four Fieldfares, six Redwings, three Song Thrushes, a male and female Blackcap, the Great Spotted Woodpecker, 10 Chaffinches, five Goldfinches and "a squeal from Smelly Gully which was either an escaped pig or a Water Rail!" They also report a Kestrel all afternoon around the Castle area. "Pallas’s Warbler ringed but unfortunately not seen thereafter. Another Yellow-browed Warbler ringed at 5pm, making a total of two in Millcombe for the day. Ring Ouzel still on the Terrace. Jackdaw in the Pig Pen near Quarter Wall (seen the afternoon before by Ellie and myself but I didn’t realise the significance ['very rare autumn migrant']). Also present were 13 Goldcrests, 7 Chiffchaffs, 8 Blackcaps, 21 Fieldfares, 14 Song Thrushes, 162 Redwings, 1 Mistle Thrush, 1 Grey Wagtail, 14 Bramblings, 73 Chaffinches, 5 Lesser Redpolls, 10 Siskins and the female Great Spotted Woodpecker. Offshore, 30 Gannets, 1 Bonxie, 12 Kittiwakes, 2 Black-headed Gulls, 20 Common Gulls and 4 Mediterranean Gulls (3 ads + 1 juv)." Meanwhile Warden Dean Jones, who spent the morning with the ringing team, found and photographed a Stock Dove close to St Helen's Church. Andy Jayne had a very frustrating sighting this morning: 16 egrets flying north-east past North Light (at 09.50 hrs) which may very well have been Cattle Egrets, but he couldn't be sure given the distance involved. It would be interesting to know if a flock of 16 egrets, whether of Cattle or Little, turned up anywhere in the Bristol Channel today. Had Andy been able to pin down the birds as Cattle Egrets, not only would they have been a new species for his Lundy list, they would also have been a new species for Lundy. That's birding! The best of the rest of Andy's sightings was a lone Ring Ouzel. 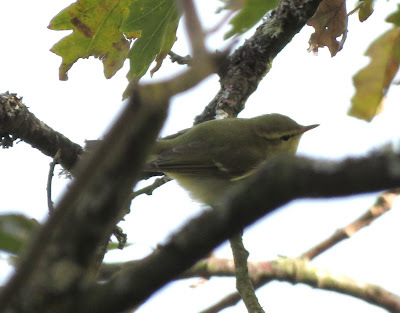 – four Yellow-browed Warblers (three in Millcombe and a new one in Quarter Wall Copse). 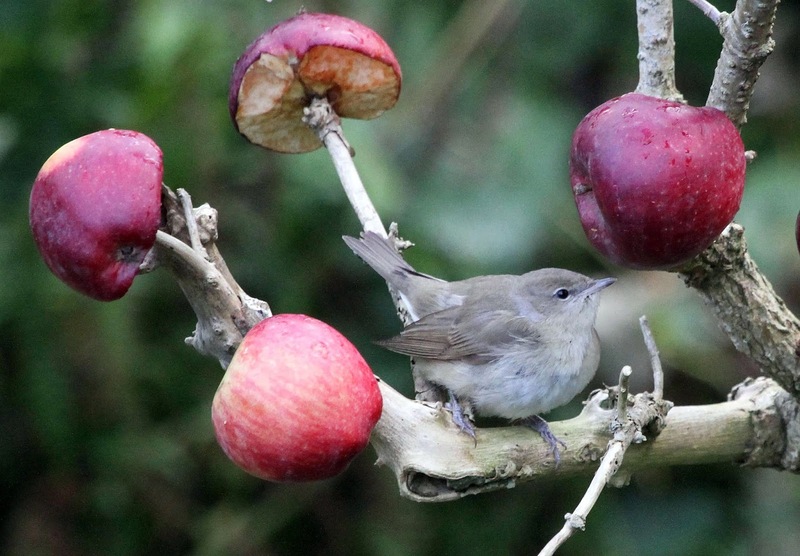 – a Siberian Chiffchaff (calling & photographed – picture to follow) in Millcombe. 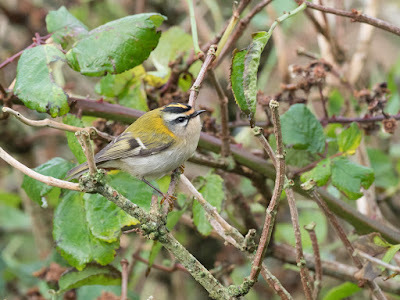 – a Firecrest in St Helen’s Copse. 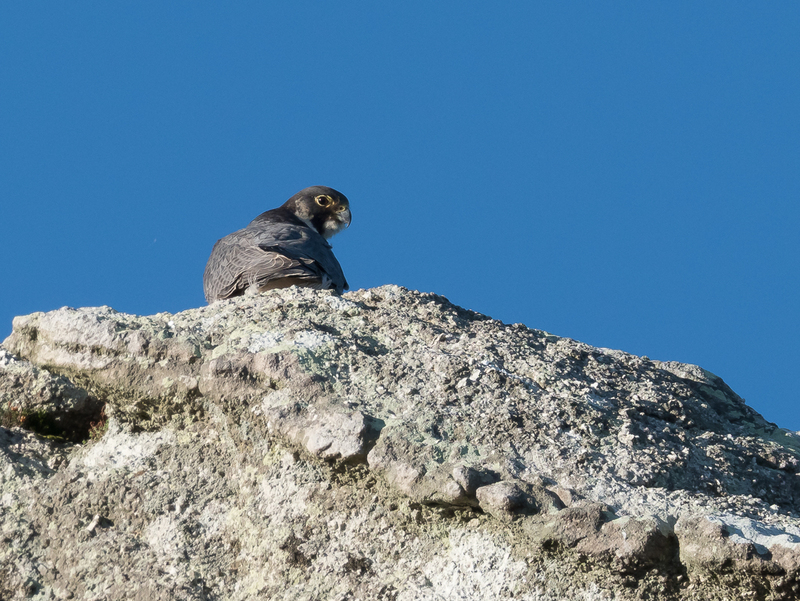 – a Ring Ouzel at the Terrace (the same bird seen later by Andy). – one Golden Plover over Quarter Wall. – a Grey Heron on Pondsbury. – one Fieldfare and eight Redwings. 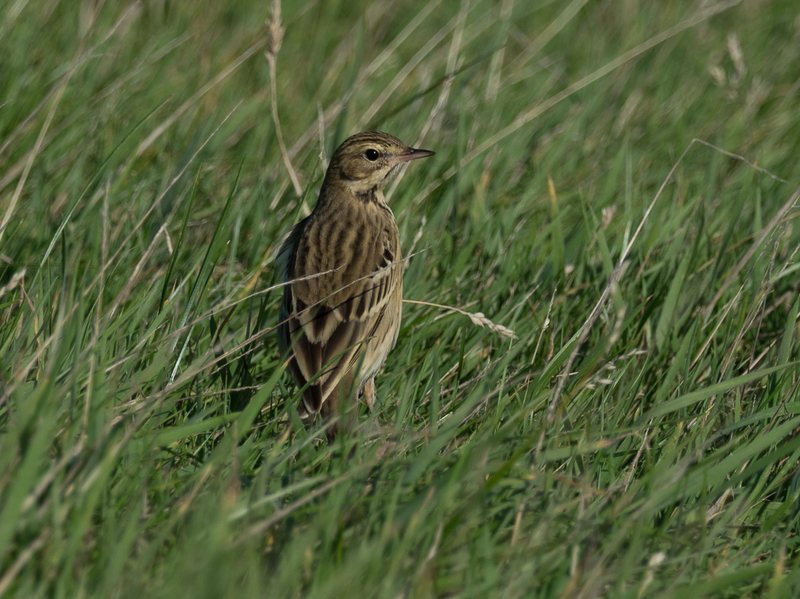 – a light passage of Skylarks, Meadow Pipits and a few finches. Seawatching produced an adult Black-headed Gull, an adult Common Gull and 58 Kittiwakes feeding offshore from Millcombe. 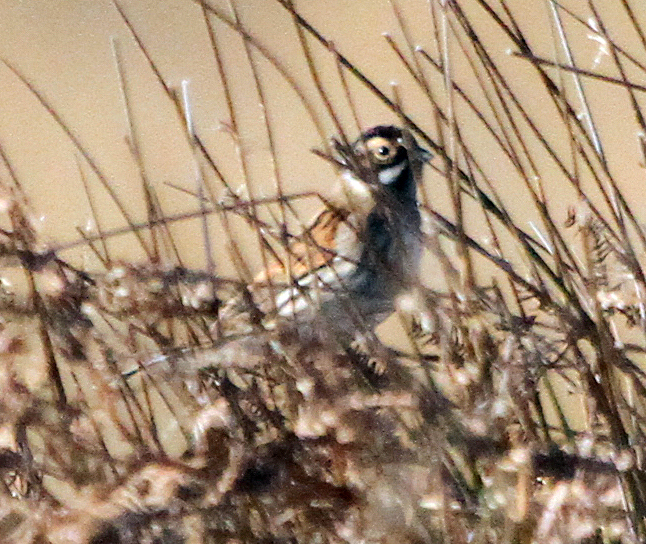 23rd Oct – “A quiet day but always something of interest"
Andy Jayne reports a Short-eared Owl roosting in rhodi brash just north of St Helen’s Combe for at least an hour in late morning, two adult Mediterranean Gulls off South End (a Lundy tick for Andy), the female Great Spotted Woodpecker and at least one Yellow-browed Warbler in Millcombe first thing, and two Merlins. Andy was joined on the island today by Paul Holt as well as Rob Duncan and his ringing team of James Booty and Justin, Ellie & Daniel Zantboer. 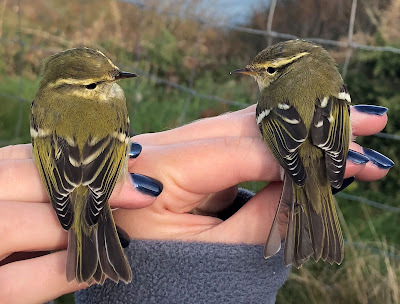 It didn’t take long before they mist-netted three Yellow-browed Warblers, two of which are pictured below. Also of note were six Redwings, two Song Thrushes, two Blackcaps, a Chiffchaff, eight Goldcrests and two Lesser Redpolls seen around Millcombe during the afternoon. 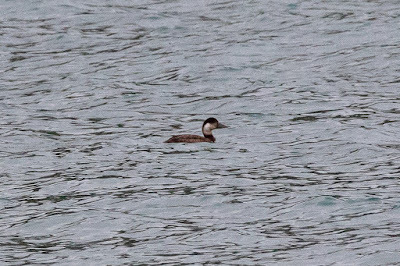 They also saw three drake Common Scoters on the crossing. 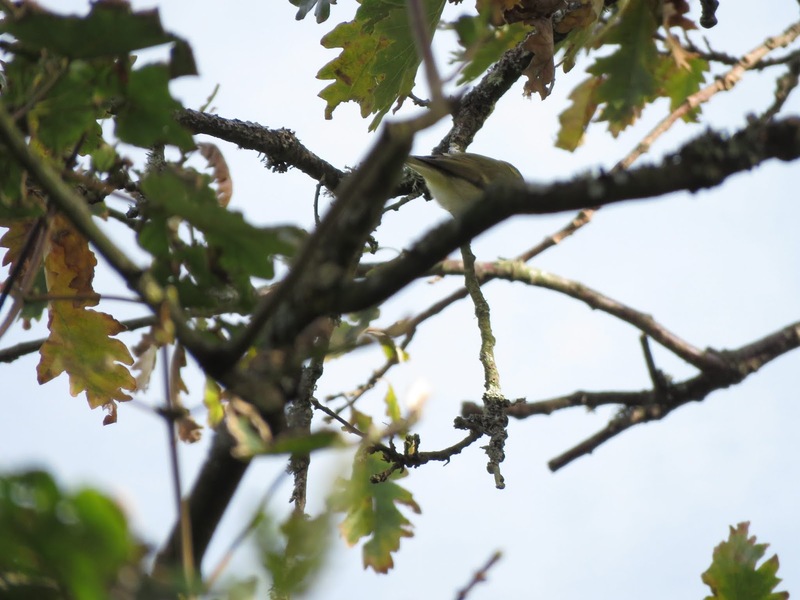 Andy Jayne had a "bit of a shock" today when at 09.55 he briefly encountered the Red-eyed Vireo in gorse and brambles on the slope above Brambles Villa. However, despite searching for much of the day, he was unable to find it again. During the evening a further text arrived from Andy: "Just seen an owl in the gloaming over South West Field, presumably Short-eared." 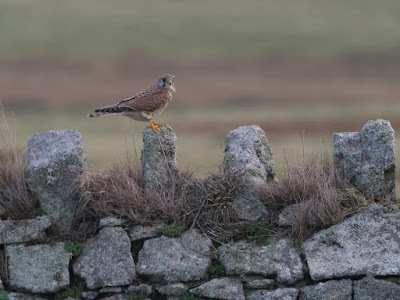 Andy Jayne's third day of birding Lundy brought a ringtail Hen Harrier briefly near Quarter Wall, a Yellow-browed Warbler and a Firecrest in Millcombe, and a Black Redstart near North Light. The female Great Spotted Woodpecker is still around, as is yesterday's Stock Dove, but new for his trip were two Mistle Thrushes. 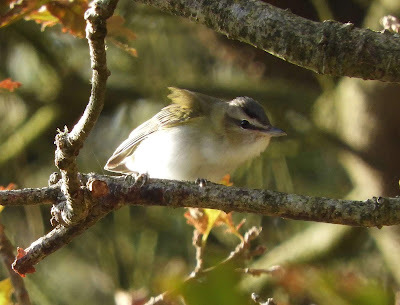 Andy Jayne reports no further sightings of Friday's Red-eyed Vireo. Highlight's of the day's birding were a Common Rosefinch, seen briefly in Millcombe in the morning, a Yellow-browed Warbler, one Stock Dove and a Snow Bunting. 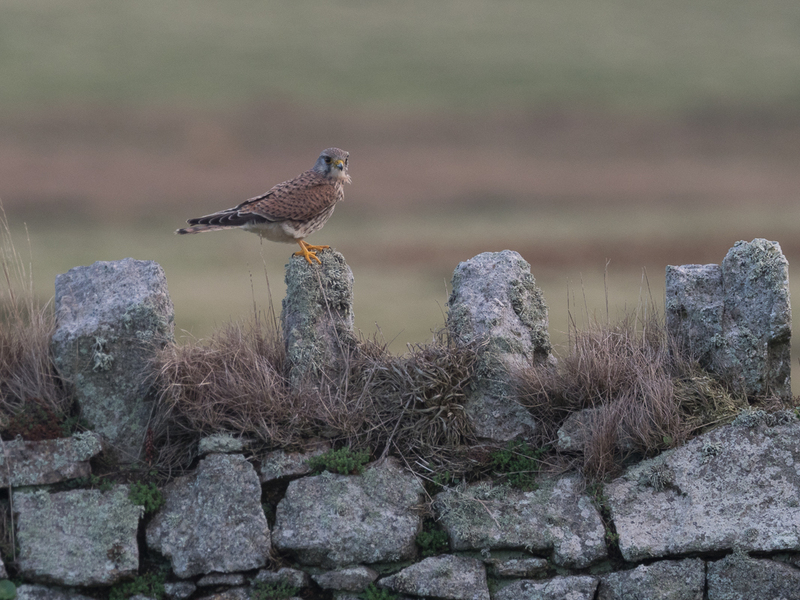 Featured here are a selection of photographs contributed by Richard Campey during his recent five-day stay on Lundy with fellow Norfolk birder Malcolm Davies (click on image for best viewing). 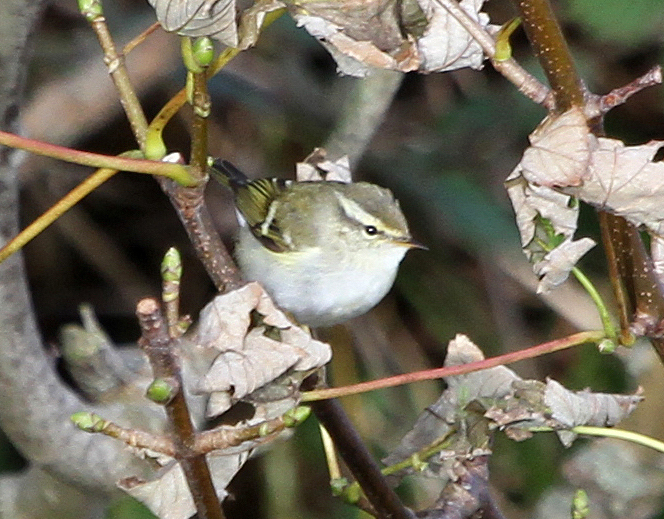 A few additions from Dean Jones for yesterday's post are a Yellow-browed Warbler in St Helen's Copse (photo below), a Black Redstart in Pigs allotments, the female Great Spotted Woodpecker photographed on Sue Waterfield's seed feeders at Pigs, a "good number" of Redwings, the first evident passage of Starlings (410), and eight Reed Buntings, mostly around Pondsbury and Quarter Wall. 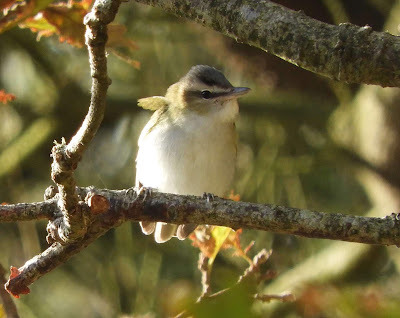 The undoubted highlight of, as Andy Jayne put it, "a generally quiet day in summer-like weather" was a Red-eyed Vireo in upper Millcombe, first seen in mid-afternoon when photographed by Dean Jones (see pictures below), and again for five minutes at 17.50. The eighth record on Lundy of this North American songbird, the last occurrence was in 2005 when one in Millcombe on 29th & 30th September was caught and ringed on 4th October and still present on 6th. 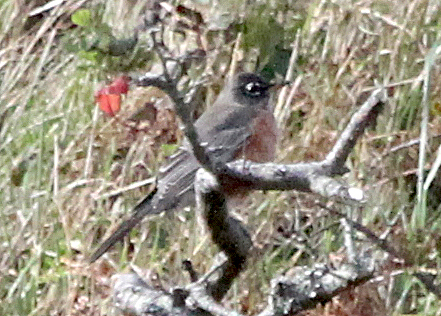 Hopefully today's bird, which proved elusive after the first sighting, will stay around for at least another day. Other birds recorded included a ringtail Hen Harrier, two Redshanks, two Firecrests, two late Willow Warblers and five Bramblings. Observations contributed by Andy Jayne and Dean Jones. 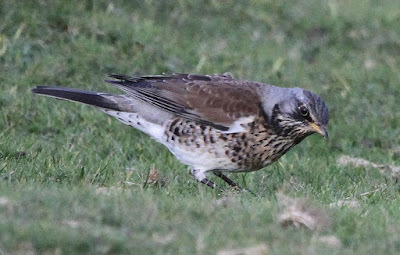 A Sparrowhawk, a Merlin, two Kestrels, two House Martins, two Firecrests, a Grasshopper Warbler (at Quarter Wall), 60 Redwings, 24 Fieldfares, a Whinchat (at Quarter Wall), two Stonechats, six Wheatears, a Tree Pipit, six Bramblings, two Siskins and two Reed Buntings, as well as small numbers of Goldcrests, Chiffchaffs and Blackcaps. Observations by Richard Campey, Malcom Davies, Andy Jayne, Dean Jones and Sue Waterfield. 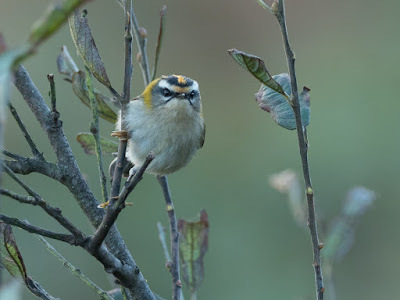 Richard Campey reports a busy day, which included two Firecrests, a Yellow-browed Warbler and Lundy's fourth-ever Cetti's Warbler in Millcombe, not to mention a calling fly-over Red-throated Pipit at Blue Bung. 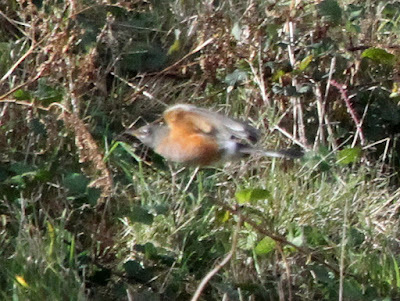 Two Bramblings and two Lapland Buntings flew over Castle Hill. The Great Spotted Woodpecker reported yesterday and still present today, turned out to be in adult female plumage, so a different bird to the juvenile seen earlier in the month. 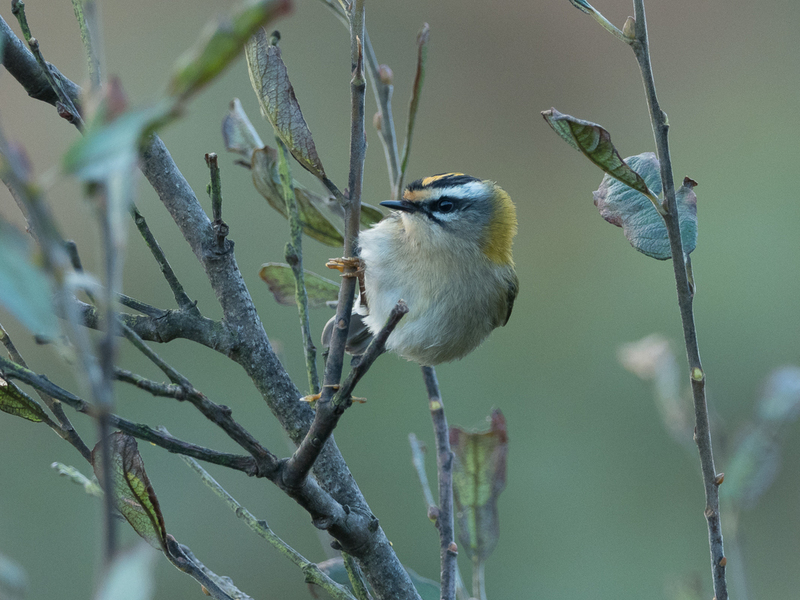 Dean Jones found another Firecrest on the Terrace. Richard Campey and Malcolm Davies woke to find that the wind had gone SW, bringing low cloud and drizzle, but things gradually dried up and the sun broke through during the afternoon. The morning saw two Yellow-browed Warblers and a Firecrest in Millcombe, along with an estimated 60 Blackcaps, three Water Rails, a small movement of thrushes, a Redstart and two Reed Buntings. 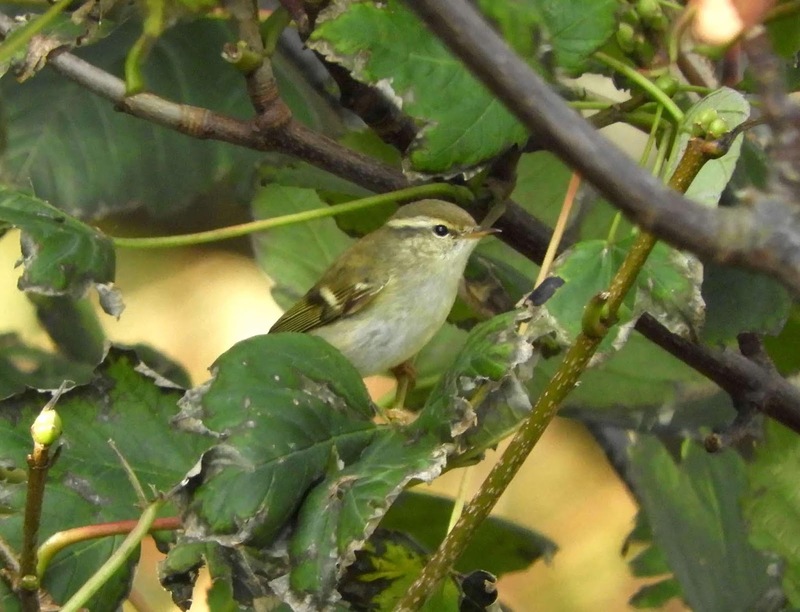 A third Yellow-browed Warbler was found along the Terrace at noon. The improving conditions saw plenty on the move later in the day, with the Blackcap total upped to 100, alongside good numbers of Goldcrests and Robins (20+) and a small passage of Meadow Pipits. 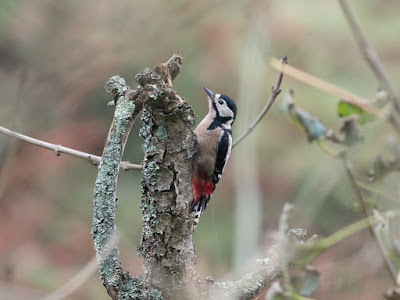 A Great Spotted Woodpecker (perhaps most likely the same bird as earlier in the month, though it has not been reported for several days) and a single Willow Warbler were in Millcombe at 4pm, but the valley was otherwise quiet by then, with most migrants appearing to have moved on. Other sightings included a Merlin over the Airfield. "NE 5-6 and overcast. 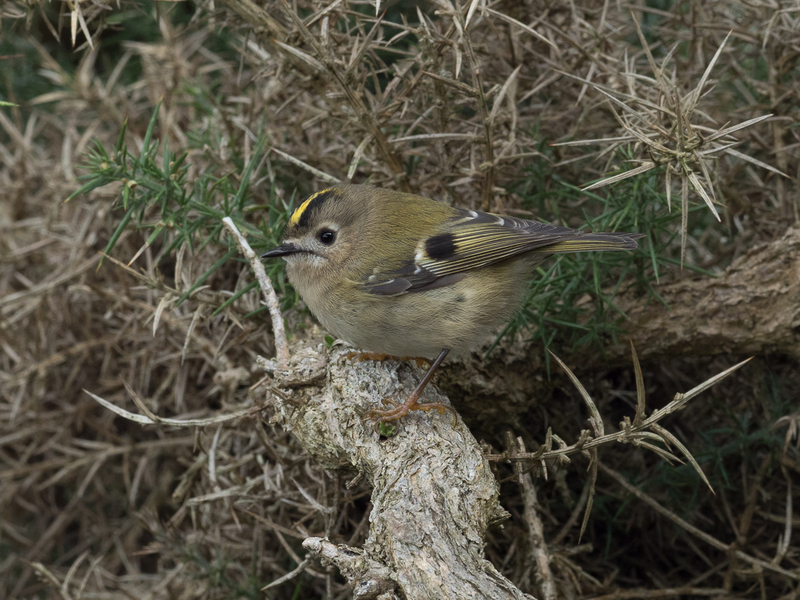 An increase in Goldcrests, 50 Redwings and a Yellow-browed Warbler all in Millcombe; Firecrest on the Terrace; two Ring Ouzels; two Black Redstarts (one at Jenny's Cove and one at North End); three Wheatears; and two Merlins. Also of note were a female Sparrowhawk, 100 Goldfinches and a Lesser Redpoll still flying around Millcombe. 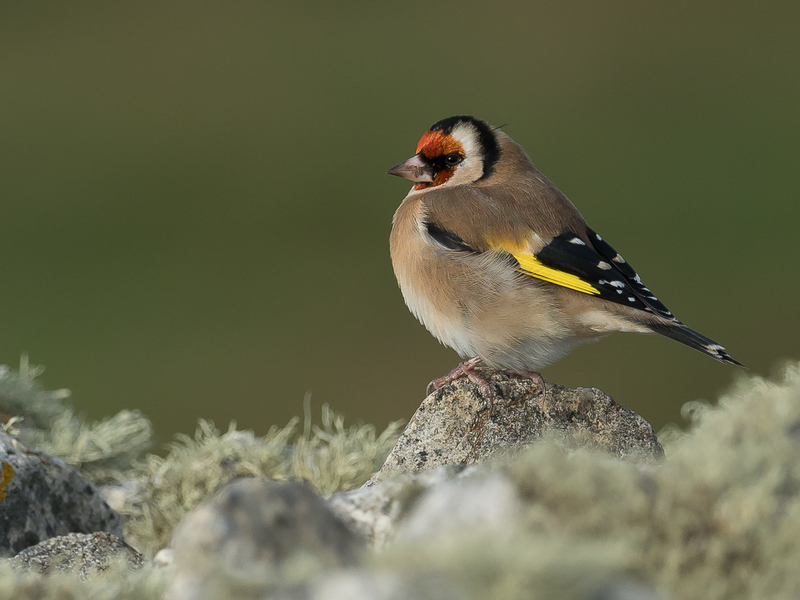 From North End Dean saw a Great Skua, two Black-headed Gulls and three Common Gulls." Observations by Richard Campey, Malcolm Davies and Dean Jones. Though centered a long way north of Lundy, Storm Callum continued to pack a punch throughout Saturday 13th, with severe gales and claggy rain resulting in the cancellation of transport to and from the island for the second weekend running. Finally making it to Lundy via MS Oldenburg from Bideford on Sunday 14th, Richard Campey and Malcolm Davies report: "Rain cleared by 11.00 am and Millcombe bathed in sunshine, with 25 Blackcaps, one Lesser Redpoll, eight Chiffchaffs, two Greenfinches, and a Tree Pipit heard calling overhead. Clearing skies and a glorious afternoon but consequently quiet on the bird front, highlights being a Swallow and four Stonechats, with the addition of two Red Admirals." "Very little showing bird wise here today unsurprisingly due to the mad winds. I’ve only managed to note a few Gannet offshore, one calling Blackcap and a House Martin overhead in Millcombe. Yesterday was much better after the rain stopped, though all and all both days have been rather quiet, with only scatterings of migrants such as Swallow, Chiffchaff, Goldcrest, Linnet, Goldfinch and Blackcap. There have been a few highlights however. There were two Yellow-browed Warblers yesterday (Thursday 11th), one in Millcombe and another on the Terrace, plus (on the same day) a single Firecrest feeding with a number of Goldcrest in St Helen’s Copse and a beautiful adult Turtle Dove in with the pigs on High Street. We also had the first Redwing of the year on the North West Point found by Matt Ridley on the 10th." Now back on the mainland, a thorough trawl, on a full-size screen, through all my efforts to capture photographs of the Green Warbler (most of which show lovely clusters of sycamore or oak leaves, but nothing else!) has revealed an additional image of the bird in stronger light. 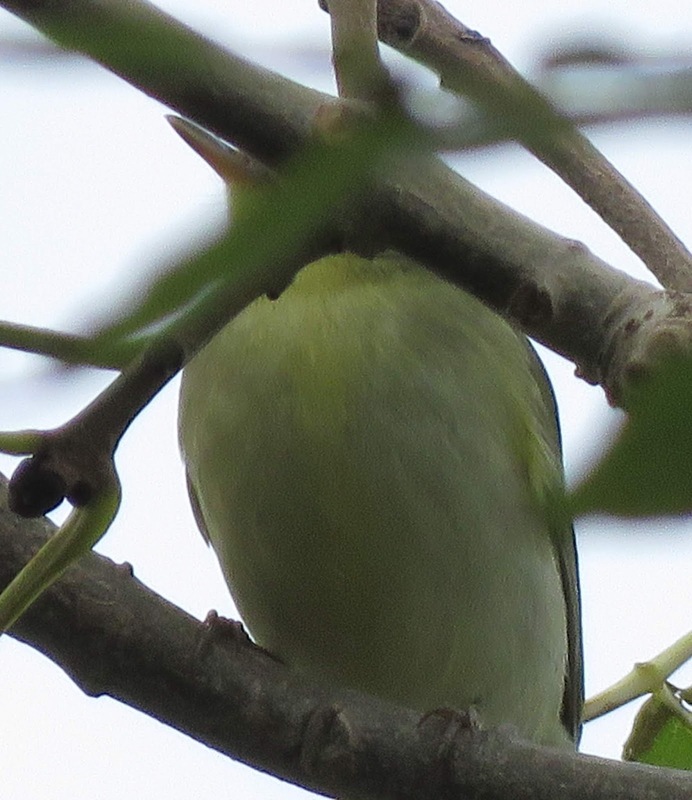 This emphasizes not only just how bright and Wood Warbler-like it was, but also appears to show that the supercilia do not quite meet over the bill, unlike some other photos and some field views, revealing just how tricky a feature this can be to pin down. On a different note, some of the posts below have now been updated with photos of Ring Ouzel (24 Sep), Red-backed Shrike (26 Sep), Jack Snipe (29 Sep), Great Spotted Woodpecker (30 Sep), Common Scoter (2 Oct), and a stunning portrait by Philip Lymbery of the still largely breeding-plumaged Great Northern Diver in the Landing Bay (see post for 27 Sep to 3 Oct). Today brought largely clear and sunny skies and though the south-west wind was still pretty blustery at dawn it dropped steadily during the day and backed to the south. 'Quiet' is probably the best way to describe the day bird-wise; there had been an evident further clearout of noctural migrants, with Millcombe holding just a handful of Goldcrests, Chiffchaffs and Blackcaps and the Lower East Side Path, taking in St Helen's Copse, Quarter Wall Copse and the Terrace, only adding a few more and there was certainly no sign of the Green Warbler in spite of careful checking. 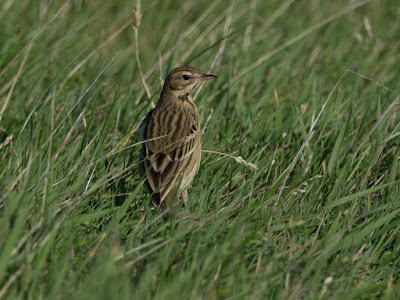 Diurnal migration was extremely sparse, featuring just five Swallows, four Skylarks, a Grey Wagtail and about 30 Meadow Pipits. 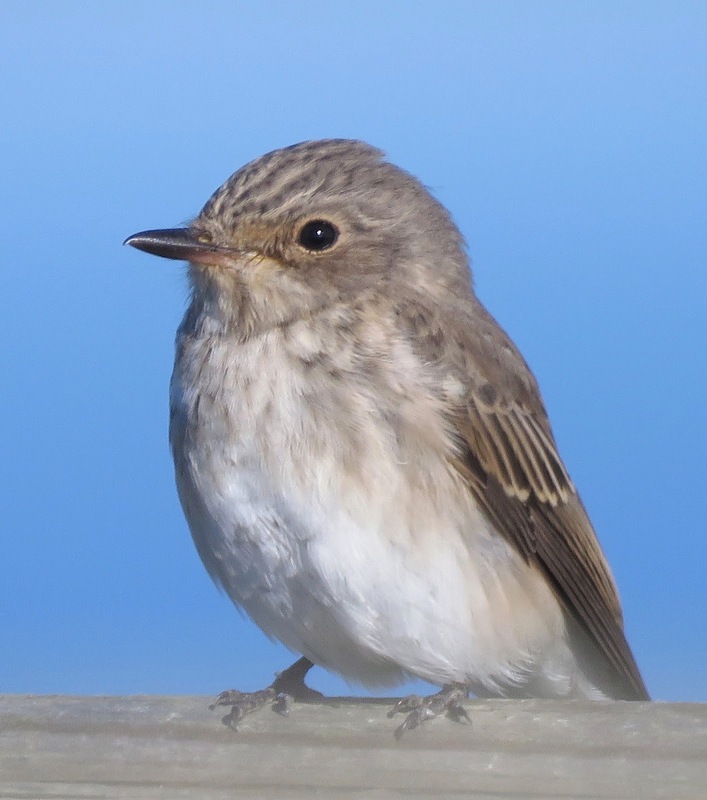 Best sightings of the day were a late female/1st-winter (Common) Redstart just below the Terrace, a Willow Warbler in St Helen's Copse, and two immature Mediterranean Gulls in the Landing Bay seen by Dean Jones and Jon Turner from the decks of MS Oldenburg as she arrived shortly before noon. A Clouded Yellow on the Terrace was amongst an unseasonably strong showing of six butterfly species. Unfortunately today turned out to be a bit of an anticlimax after the excitement of yesterday. The morning dawned heavily overcast and breezy from the SW, with spots of drizzle in the wind, although the south side of Millcombe was quite sheltered, meaning that the Green Warbler should have been findable had it still been present. 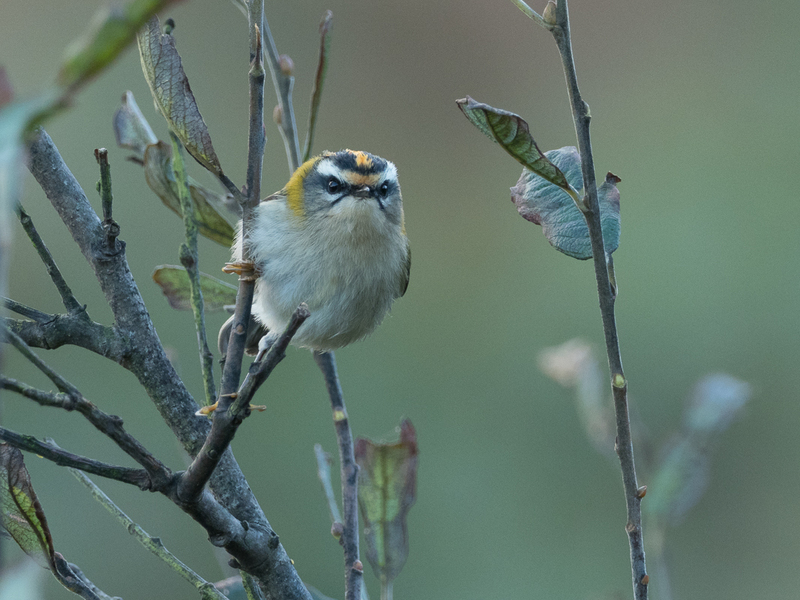 Though the continued presence of Chiffchaffs and Goldcrests gave rise to early hopes, there had been no sign of the bird – Tim Davis and Tim Jones had been out searching since dawn – by the time the first of three small boats arrived bringing a total of 34 birders/twitchers to the island. In spite of further scouring of the valley, it became increasingly clear that the bird appeared to have done a disappearing act and sadly everyone departed empty handed. Thanks to all those who came over for good naturedly following the guidelines on sticking to footpaths and respecting the privacy of others. 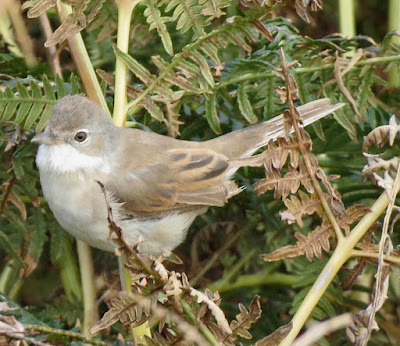 The few notable birds recorded during the day (which saw minimal visible migration) included the Great Northern Diver in the Landing Bay, single late Willow Warbler and Spotted Flycatcher in Millcombe (presumed the same as yesterday), two Greenfinches, a Grey Wagtail and a handful of Swallows. Matt Ridley, a member of the National Trust Working Party that arrived yesterday to undertake voluntary conservation work, saw a Short-eared Owl north of Threequarter Wall at around 10.00 am. 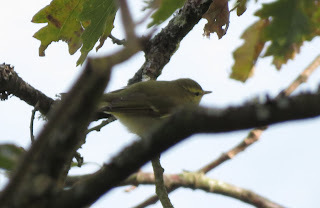 7th Oct – 'Greenish Warbler' in Millcombe identified as Green Warbler! Please do not phone the Lundy island landline for news of the Green Warbler. The Warden is currently off island and the hard-pressed admin & catering staff are not birders and will not be able to help! 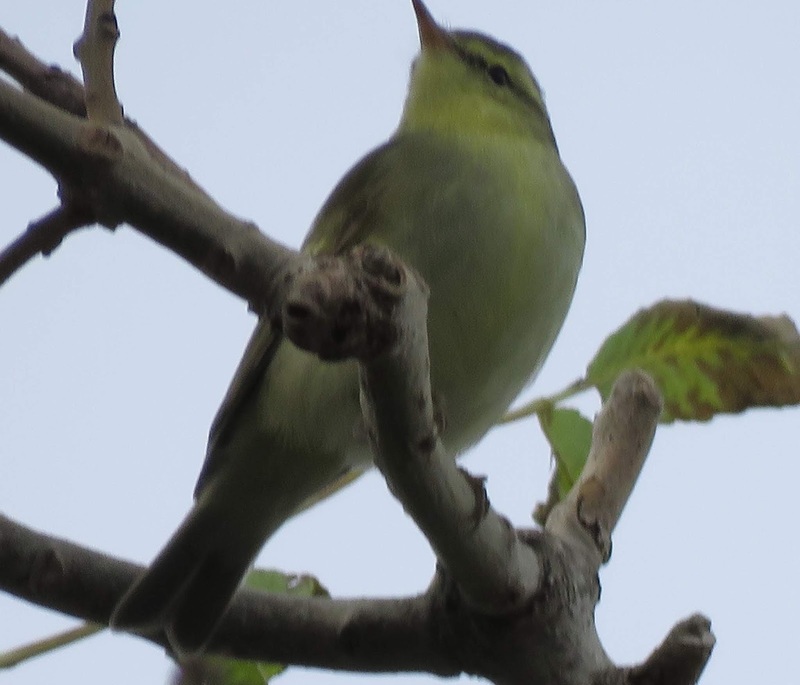 For birders coming to Lundy to look for the Green Warbler, please keep to the footpaths in Millcombe and respect the privacy of those holidaying in the properties around the valley. Many thanks to everyone for your understanding and cooperation. 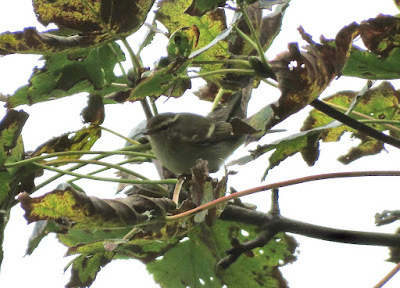 A full round-up to follow, but the highlight of the day has been a 'Greenish Warbler' [subsequently identified as a Green Warbler – the UK's fifth and the first for Lundy and Devon] found in Millcombe by Tim Jones & Tim Davis at just after 09.00 and which continued to show well around the valley for much of the day, in company with Chiffchaffs (20+), Goldcrests (15), Blackcaps (40+) and single Willow Warbler and Spotted Flycatcher, not forgetting the Great Spotted Woodpecker – itself a rarity (for Lundy!). The Great Northern Diver was also back on fisheries patrol in the Landing Bay after going AWOL in yesterday's northeasterly gale. Saturday 6th October had been a day of very strong north-north-easterly winds, with early rain giving way to sun in the afternoon. Sunday 7th dawned fine and dry with some patchy cloud and just a light N breeze, falling away to nothing by mid-morning and then a fresh south-westerly getting up, along with increasing cloud, during the afternoon. At around 09.10 hrs on 7th, Tim Davis (TJD) and Tim Jones (TAJ) were walking along the north side of Millcombe, the valley containing the largest area of trees and shrubs on Lundy, having earlier been monitoring visible migration on Castle Hill. TAJ glimpsed a warbler with a prominent supercilium and wing-bar and said “I think I’ve got a Yellow-browed” (having seen two on 4th/5th October, including one in Millcombe). He quickly corrected that, saying “No, it’s not a Yellow-browed… What the hell is it? !” The bird then showed quite well, if briefly as it moved through sycamore leaves, to both TAJ & TJD. 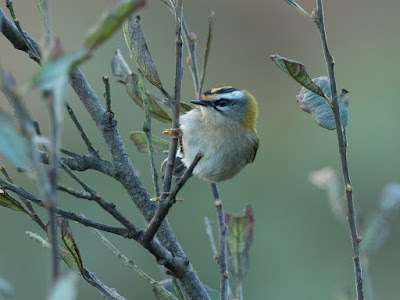 Both noted a single wing-bar, very long supercilium, orangey bill and generally bright plumage, TAJ being particularly struck by the yellowish tones in the plumage, but with no field experience of Green Warbler and very little of Greenish, was unsure how yellow was ‘too yellow’… The bird dropped down and disappeared from view. We spent a few minutes trying to relocate it but it seemed to have done a runner. Both of us were needed for duties elsewhere, having offered some voluntary time to support island staff, and couldn’t get back to Millcombe until 12.00, when after about 25 minutes’ searching we found the bird feeding in Turkey oaks and sycamores on the opposite (south) side of the valley, loosely associating with Chiffchaffs and Goldcrests. We again watched the bird moving through the canopy at some speed, often against the light, which made snatching record shots with a bridge camera quite a challenge (though TAJ managed a few of the upperparts). 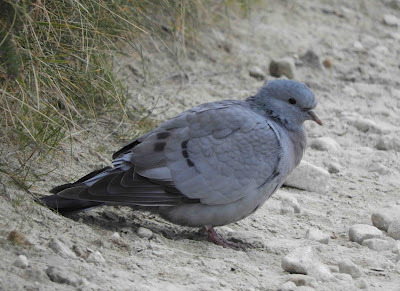 The bird was constantly moving ahead of us and once more dropped out of sight after about 10 minutes. It was not until 14.30 that we caught up with it again, back in the same area where it had started out at 12.25, but again it was moving away. At 15.25 it was in ash and sycamore trees above the gas store in lower Millcombe, when it rested in the semi-open for a few minutes, enabling some better record shots to be taken, albeit of the head and underside only. At 15.45, when it was last seen, it was in ash and aspen next to the gas store – again associating with Chiffchaffs and Goldcrests. Altogether we estimate that we watched it for about 40 minutes. Description: Phylloscopus warbler approximately the size of a Chiffchaff, with a notably prominent, slightly upturned orange bill. 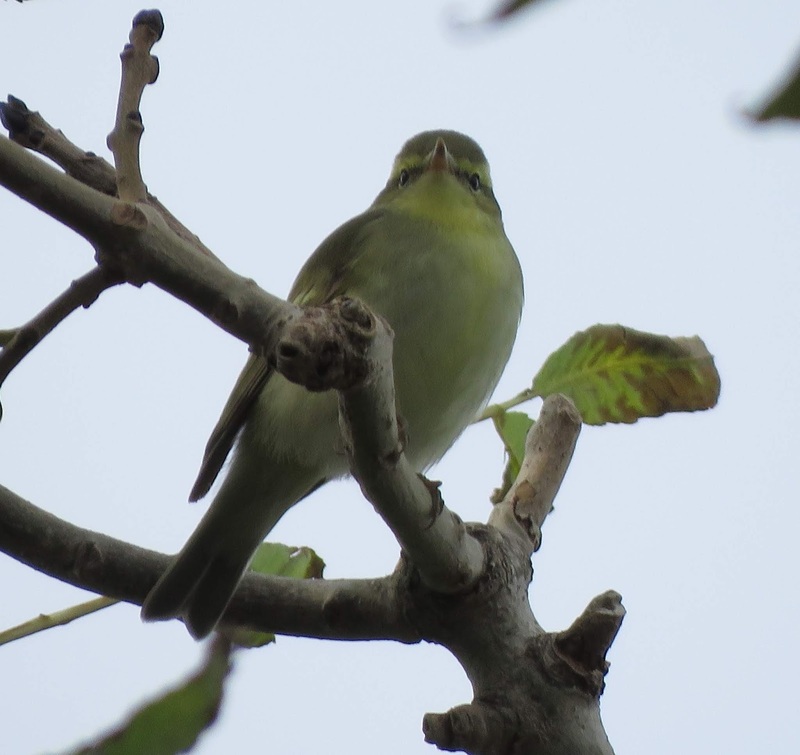 Long yellowish-white supercilium that appeared to us, at least on some views, to meet over the bill. Single quite prominent whitish-yellow wingbar. Prominent yellow body feathering near alula, making yellow mark near 'shoulder' bend in wing. Upperparts rather bright greenish. Tertials narrowly tipped paler. 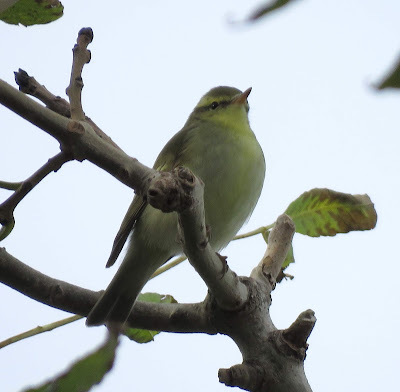 Throat and face suffused with lemon yellow, very much like Wood Warbler. Rest of underparts more whitish but washed with yellow. Legs brownish. After some early rain, skies gradually brightened, giving way to bright sunshine in the afternoon. Daytime migrants such as finches, pipits and hirundines were able to harness the NE blast to tack across towards Hartland Point in surprisingly good numbers from mid-morning onwards, the counts below being just a sample of what moved through. Millcombe was pretty much blown out and watching in the few sheltered spots suggested that there probably wasn't much skulking around anyway, though the Great Spotted Woodpecker was still present. 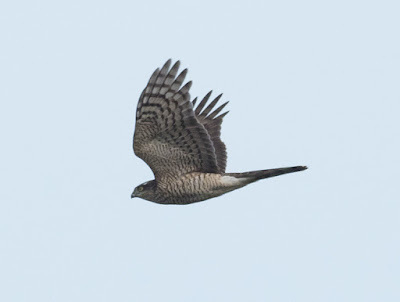 A roundup of the rest of the day's more notable records includes: single Sparrowhawk, Golden Plover and Merlin, five Kestrels, four Skylarks, 54 Swallows, three House Martins, two Stonechats, a Wheatear, 20 alba wagtails, a Grey Wagtail, 222 Meadow Pipits, 18 Rock Pipits (including a flock of 15 feeding on a sheltered sunny slope at Dead Cow Point), 106 Goldfinches and 83 Linnets. Observations by Tim Davis & Tim Jones. 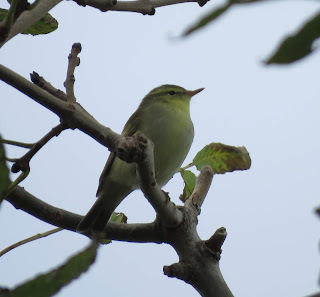 In a case of south-west meets north-east, the birding highlights of a largely overcast and gloomy Friday 5th October, with a light SW wind, were a Melodious Warbler on the Terrace and a Yellow-browed Warbler in Millcombe. The Melodious Warbler, initially perched on top of the Terrace Trap willows next to a Chiffchaff, showed well for about 10 minutes for Tim Jones & Tim Davis, but couldn't be relocated after taking a long flight and diving for cover. The Yellow-browed Warbler was in the sycamores around the stream down from Brambles and was presumed to be the same bird as seen on 4th, but views were too distant to compare plumage details. 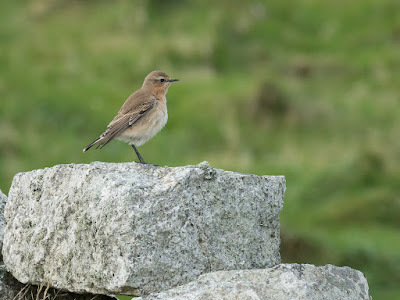 The supporting cast was provided by the Great Spotted Woodpecker, which was in Millcombe again during the late afternoon, the Great Northern Diver in the Landing Bay, a late Spotted Flycatcher in Millcombe, a Wheatear (probably Greenland) in Lighthouse Field, and a Tree Pipit calling over the Terrace. 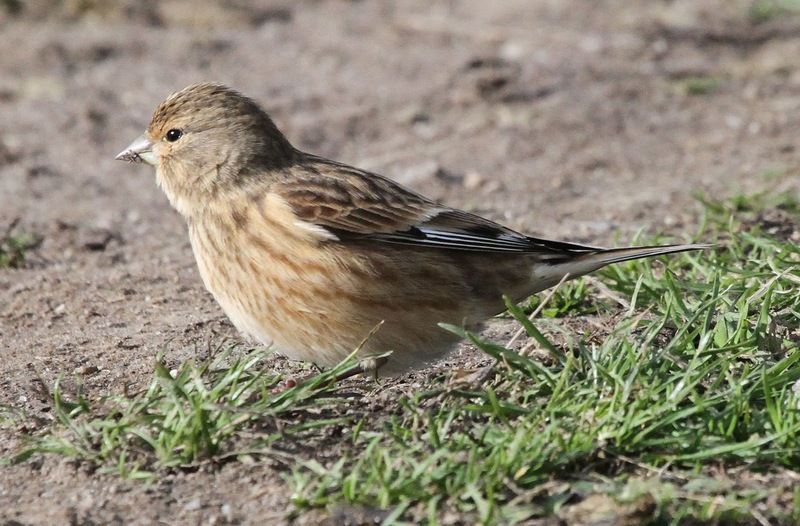 Visible migration was slow to non-existent until the early afternoon, when there was a burst of hirundines, pipits and finches moving south along the East Side. In late news for Thursday 4th, Ken Ebsworthy & Darrin Dowding saw a first-year Osprey over South Light during the early evening. Unfortunately for him, Ken & Darrin's mate Ryan was fully occupied with a plate of ham, egg & chips in the Tavern at the time! The day started off with the amazing sight (for Lundy) of four Little Egrets flying past the Landing Bay from the north-east, rounding Rat Island and continuing south-west – watched from the lofty vantage point of Castle Cottage by Chris & Carol Baillie. Although Little Egrets have been virtually annual since 2007, with only 2012 drawing a blank, this was the highest ever count for the island, the previous maximum being three on 16 May 2002. Today also brought two Yellow-browed Warblers, the first showing well in Millcombe throughout the morning and the second in bracken along the East Side Path just north of the quarries during the late afternoon. The second bird had much broader whitish fringing to the tertials than the first, confirming them as two different individuals. 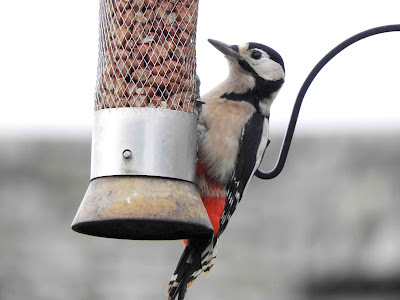 The Great Spotted Woodpecker was seen again, once more dividing its time between Millcombe and the Terrace. Also continuing its stay was the Great Northern Diver, still largely in breeding plumage. Other notable sightings for the day included two Merlins, two late Sand Martins, an equally tardy Whitethroat and three Firecrests. Visible migration was less evident than on 3rd, but totals included 73 Swallows, 4 House Martins, 5 alba wagtails, 280 Meadow Pipits, 53 Linnets, 105 Goldfinches, a Greenfinch, 4 Redpolls, 10 Siskins and a Reed Bunting. 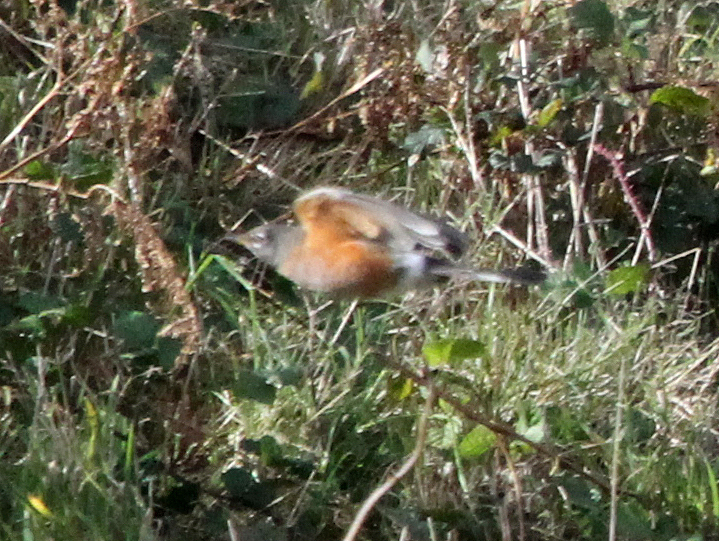 Other migrants were represented by 22 Chiffchaffs, 11 Blackcaps, 12 Goldcrests, 5 Stonechats and 21 Robins. Records contributed by Carol & Chris Baillie, Tim Davis, Darrin Dowding, Ken Ebsworthy, Tim Jones and Ryan Miller. The week from Thursday 27th September to Wednesday 3rd October saw largely fine, settled weather, with often sunny skies by day and moon- and starlit nights, although the last two days of the period brought some low cloud and light drizzle. There were small overnight arrivals of warblers, crests and flycatchers in Millcombe on most days, which kept the ringers based at Brambles occupied. These included: Goldcrest (maximum 40 on 30th), Chiffchaff (max 60 on 29th), Blackcap (max 70 on 29th) and Spotted Flycatcher (max six on 27th). Also two Willow Warblers (29th), single Garden Warbler (29th), Whitethroat (30th & 1st) and Reed Warbler (27th to 1st) and single Firecrests (on 29th & 30th). A Mistle Thrush perched briefly on dead pines near Blue Bung on 29th was the first of the autumn and there were single Song Thrushes on several dates. One or two Redstarts were recorded on four dates, whilst the highest Wheatear count was 13 on 29th and Stonechats reached eight on 29th. There was strong diurnal migration on several days with peak counts including: at least 4,000 Swallows on 27th, 200 House Martins (27th), 33 alba wagtails (1st), 1,000 Meadow Pipits on 28th, 330 Linnets (29th) and 160 Goldfinches on 30th. Less numerous species included Sand Martin (one on 29th), Grey Wagtail (up to three daily), Siskin (max 13 on 29th), Redpoll (max five on 1st), Reed Bunting (a female in Millcombe on 1st) and a Snow Bunting flying out to sea from the Castle on 28th. 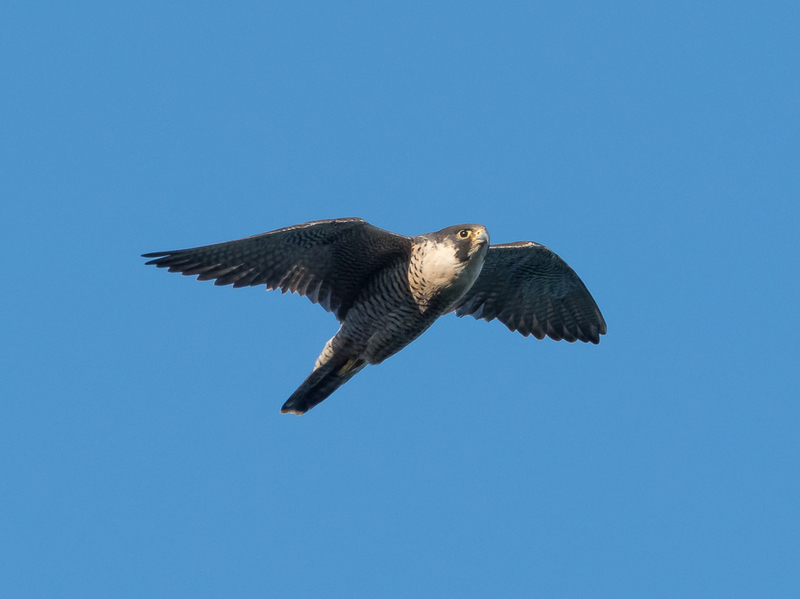 Raptors took advantage of the abundant passerine prey, with multiple daily sightings of Sparrowhawk (max two), Merlin (max two), Kestrel (max six) and Peregrine (max four). The juvenile Red-backed Shrike found in Millcombe on 26th was still present near Millcombe House late morning on 27th, but was not seen after that. 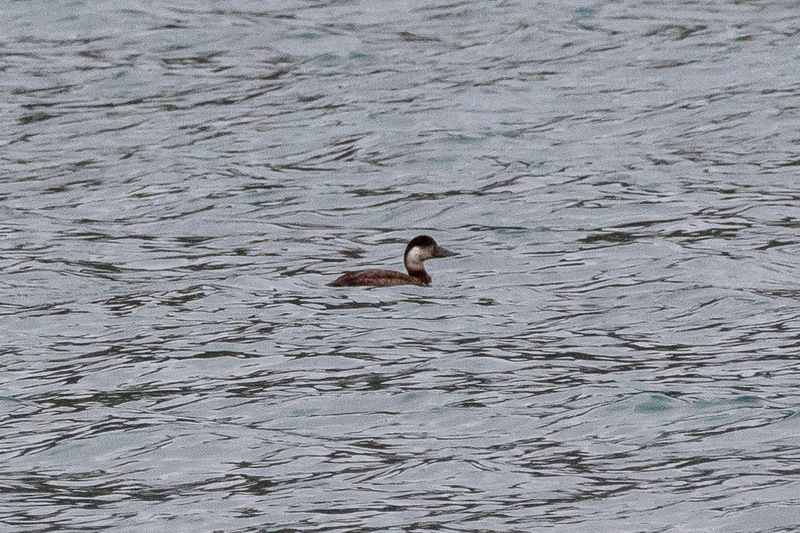 Scarcities (for Lundy) included a first-winter female Common Scoter in the Landing Bay on 2nd/3rd, seen to fly off strongly to the east on the morning of 3rd (see photo below), a juvenile Great Spotted Woodpecker ringed in Millcombe on 30th and seen at various locations along the East Side as far north as VC Quarry daily thereafter. 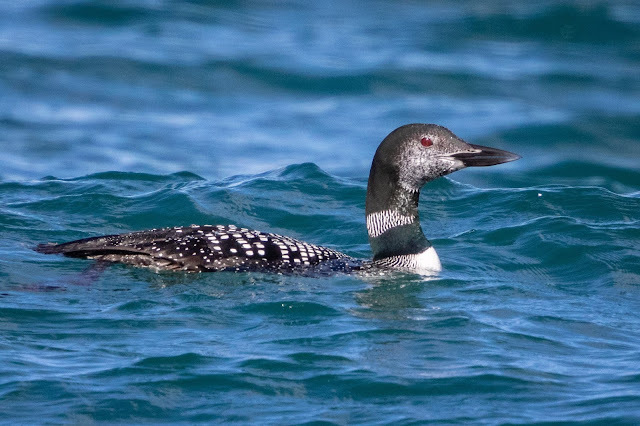 The Great Northern Diver was seen daily in the Landing Bay (see the magnificent portrait below by Philip Lymbery) and a second bird was seen passing the island on 29th. 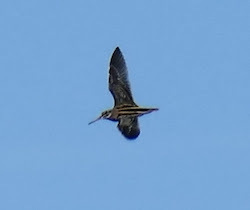 There was a Jack Snipe at Pondsbury on 29th, three Lapwings were on the Airfield on the 29th and one or two Golden Plovers were seen or heard daily. A first-winter Common Gull flew across the Landing Bay on 30th, and there was a single Collared Dove on 29th (only the second of the autumn). 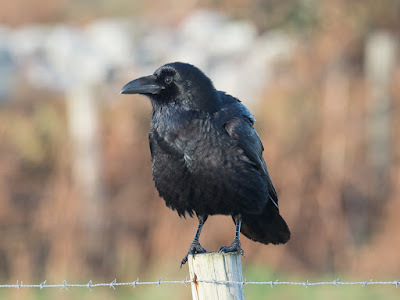 Sightings from multiple observers, including Carol & Chris Baillie, Paul Bullock, Tim Davis, Keith Dean, Chris & Mandy Dee, Darrin Dowding, Ken Ebsworthy, Tim Jones, Helen & Philip Lymbery, Ryan Miller, Alan & Sandra Rowland, Sue Sabin, Jan Swan and Martin Thorne.